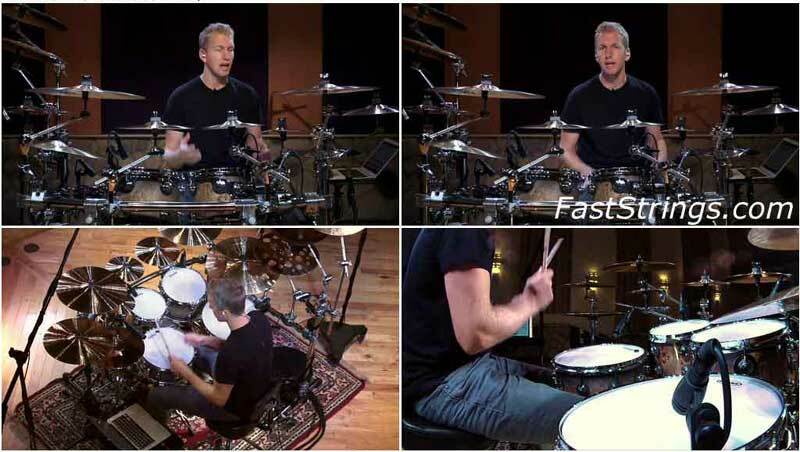 Jared Falk Successful Drumming DVD 4, 5, 6 download. The Successful Drumming training package includes ten training DVDs, seven audio CDs, and an interactive workbook that is spiral bound to sit perfectly on any music stand. The DVD, CD, and workbook content works in perfect harmony to give you the best possible learning experience. Best of all, the measurable format makes it easy to track your progress so you always know what to do next. This realese contains DVDs from 4 till 6. DVD4: The Breakdown. Playing the drums is all about creating music and jamming with other musicians. In this section, you’ll discover three valuable tools that simplify the way you learn and understand music. These tools are ideal for drummers who are interested in playing live gigs, doing studio work, jamming with musicians, playing in a church, learning cover songs, or creating original music. You’ll first be introduced to The Drumming Cheat Sheet which simplifies the process of learning the form of a song. Then you’ll get a chance to use The Drumming Song Simplifier to quickly and easily learn the parts of your favorite songs. And finally, you’ll discover The Note Value Recognition System which makes it easy to identify the feel of a song in just four to eight bars. Each tool is helpful on its own, but the real advantage comes when you combine them. DVD5: The Bassist. When it comes to playing drums along with music, it’s critical for drummers to work well with other members of the band. It doesn’t matter if we are performing live, recording separately in a studio, or even jamming along with a play-along song – we need to appreciate and understand how to play in relation to what other band members are doing. The most important relationship is with the bassist and what they are playing. In this section you will be introduced to The Locked In System. It includes three important phases to consider when ‘locking-in’ with a bassist. Reviewing these ideas will help you create a solid foundation to make the band sound and perform better as a team. DVD6: The Band. For many drummers, the ultimate goal is to create original music with a band. However, the process of writing and collaborating on original ideas isn’t always easy. With that in mind, this section provides a unique opportunity to witness the creation of five original songs. You’ll have a chance to see the initial idea presented by a single band member, and then watch how the entire band comes together to turn that idea into a full song. It isn’t easy to form a band. Worse still, many bands fail to achieve the success that they originally set out to accomplish. With that in mind, this section also features The Successful Band Method. It’s a simple process for establishing your musical goals, and it also includes ten important guidelines to follow in order to increase the likelihood of success. please, can you upload “Jazz Drumming Demystified” by Ralph Peterson??? i’ll be really grateful!